A few weekends ago, I noticed that when we washed clothes that water was coming up through the floor drain in the basement. I did what I always did and called my neighbor John, who's a great plumber. He came over on Monday, I went to work, and when I came home he said he'd spent 3 hours working on the floor drain. He thought he'd fixed it. The weekend after that, when we used the washer, the water came up through the floor drain again. But it also happened when we drained the bathtub, flushed the toilet, or ran the dishwasher. I knew this meant that the drain was plugged farther down. I called John again. John the plumber came over again, on a Tuesday this time, and started working on the problem. This time, I got a call from him during the day. "Not very well. I just spent six hours working on your drain, and now I've got a the snake caught." He told me a tale of trying to get the snake out of the drain hundreds of times, sometimes risking life and limb due to the tension on the snake uncoiling. 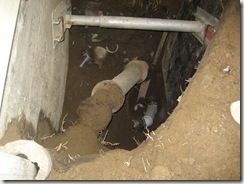 He ended the call with, "Sorry, but you can't use your plumbing right now." That last sentence made me pause, but I didn't have much time to reflect. I happen to be having one of those crazy busy weeks at work -- and Brenda was out of town, which made me a single parent for a few days. I called Jim Dandy, a recommended and well-established plumbing company in Seattle, and set up an appointment for 10:00 a.m. the next morning. When I got home that night, I looked at the problem in the basement. 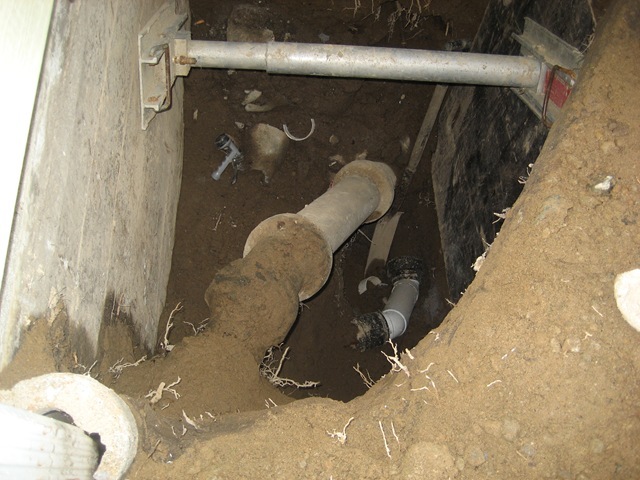 Indeed there was a plumber's snake stuck in the drain stack -- and it wasn't one of those small ones. I knew this was serious. The boys and I went to a hotel for the night, which was in itself stressful (imagine a 4 and 8 year old jumping across beds from the moment we walked in the door -- but that's another story). 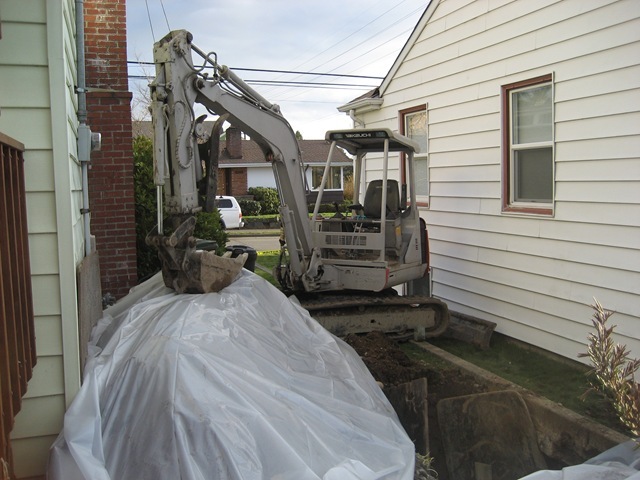 At noon the next day, two plumbers showed up from Jim Dandy. Their first job was to pull the plumber's snake out of the drain stack. I worked upstairs on my laptop to the sounds of grinding machinery and occasional curses. When all was said and done, they couldn't get the snake out. 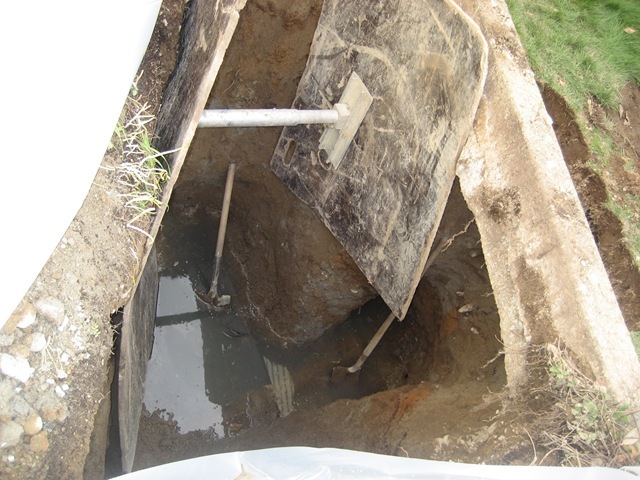 But they did find where the blockage was -- right under the last section of my deck. They said they were going to have to dig. "We'll get the estimator out here to give you a bid." Dollar signs seemed to hang in the air with the word bid, like a comic book text bubble. I'd heard horror stories: $10,000, $20,000, or more, once they start to dig. The estimator came out, a nice guy named Chris. He took a look around, and then went out to his pickup to write up my bid on his wireless computer. "It'll be in your inbox in 10 minutes." When the bid came in for around $3000, I breathed a sigh. The really good news was they could start the next day on the project. And I would be able to use my toilet by Thursday. I went to pick up the kids, and then we went to stay with my brother and his fiance for the night (but that's also another story). 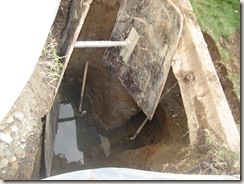 When I got home that night, I found a huge hole behind my house and my toilet was working. On Thursday night, I got another call from Chris about what they had found. Evidently, the pipe that ran under my deck had eroded away. 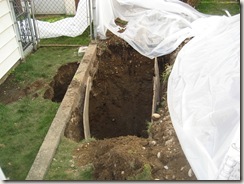 If I didn't replace it, I would have Jim Dandy out digging again -- maybe next week, maybe in years. "The bid will be in your inbox tonight," Chris told me. Now the word bid seemed to bring with it a whole new level of dollar signs. I'd finally joined some kind of club of home owners who had had large machinery on his property. My joke to my neighbors and other friends was, "Like my new digger?" Maui and Vai are coming back on Monday and probably Tuesday. So, hopefully this project will be done this week.